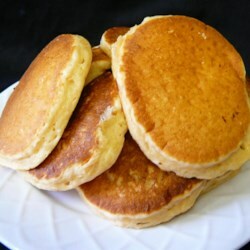 "You will love these big fluffy pancakes even if you don't like eggnog. It's a great way to start any day, especially Christmas morning. I suggest clarifying the butter but you don't have to if you don't want to." In a bowl, mix the flour, sugar, baking powder, and salt. Make a well in the center, and pour in the eggnog, butter, and egg. Mix until dry ingredients are evenly moist. Pour 1/4 cup batter onto the hot griddle for each pancake. Cook pancakes until bubbly on top. Flip with a spatula, and continue cooking until lightly browned on bottom. See how to make a simple 5-star pancake recipe. They turned out good. Solid eggnog flavor without being overwhelming. I used about 3/4 cup eggnog about 1/4 - 1/2 cup 1% milk.